In my little urban garden, I make the most of my smaller-size growing space by growing up. I grow vertically in a number of ways. Here are some successes I have had. This is an easy rose to grow. It is maintenance-free except for pruning, as it gets very big and very tall. If you have never grown a rose, this is a great one to try. I have never sprayed mine or had disease or pests. I first learned about this rose when my sister’s amazing next-door neighbor planted one so that my sister could see it outside her kitchen window. (How is that for a nice neighbor? Yes, the whole family sobbed when they moved.) The William Baffin Climbing Rose blooms a bright pink for a good part of the growing season. Mine is taller than my garage after 5 years. I love it! I saw this idea in Martha Stewart’s magazine and loved it. I knew I had to do it somewhere. I had the perfect spot, a combination of a high traffic area and an eye sore of a cement corner with no space for growing, plus I can see it from my kitchen window. 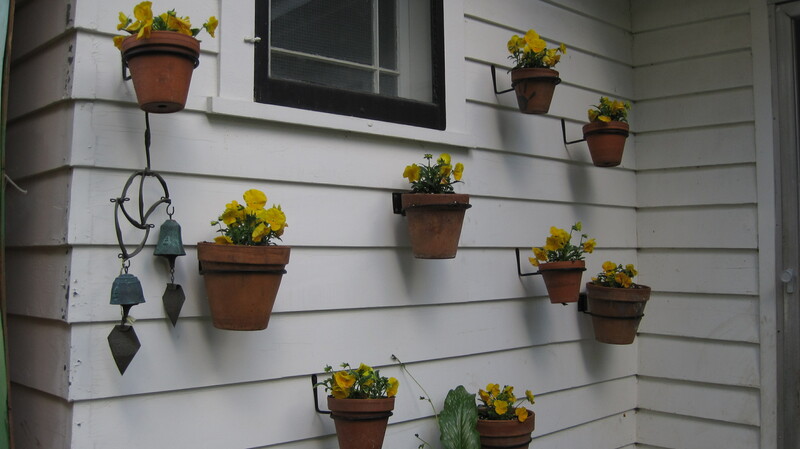 One of my gardening goals for 2011 is to grow a living wall with Woolly Pockets. Nothing like enjoying your morning cup of coffee on the sofa with a few blue morning glories. As I wrote in a previous post, this was my daughter’s idea and a family favorite. With help, old-fashioned vining petunias will get very tall. I place 4 or 5 bamboo sticks in a pot and tie them at the top to form a tepee. This guides the old-fashioned vining petunias as they grow. This is not yet a success, but look for a picture in a future blog. I heard they are slow-growing. 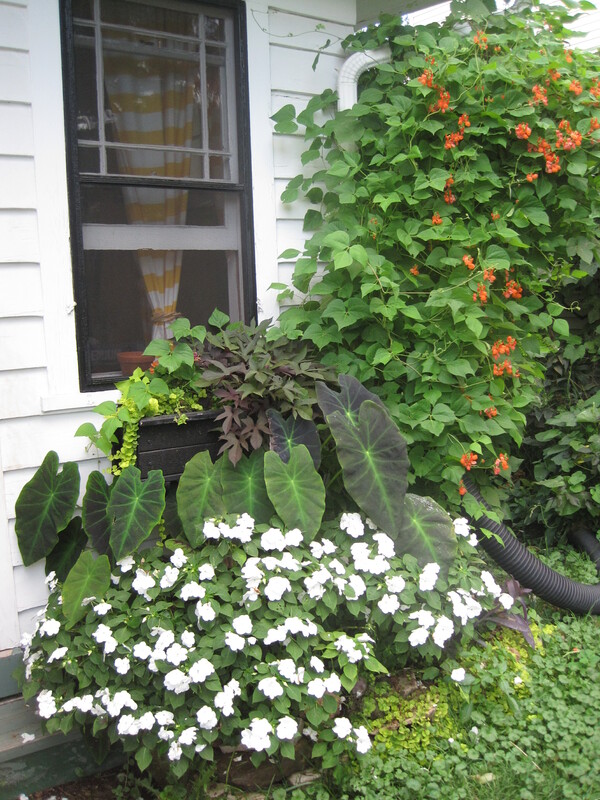 My biggest success of the 2010 summer – I grew this both as a garden entrance to our Magical Kingdom and as a good cover-screen to hide our unsightly rain barrels. We ate both the edible flower and the edible beans chopped up in our salads every night for dinner this past summer. This was a really fast grower so both the entrance and the screen for the rain barrel had good coverage in just a few short weeks. I just planted this rose last summer, hoping it is the white version of the William Baffin Climbing Rose. I will get back to you on it. I love to grow these up cornstalks. 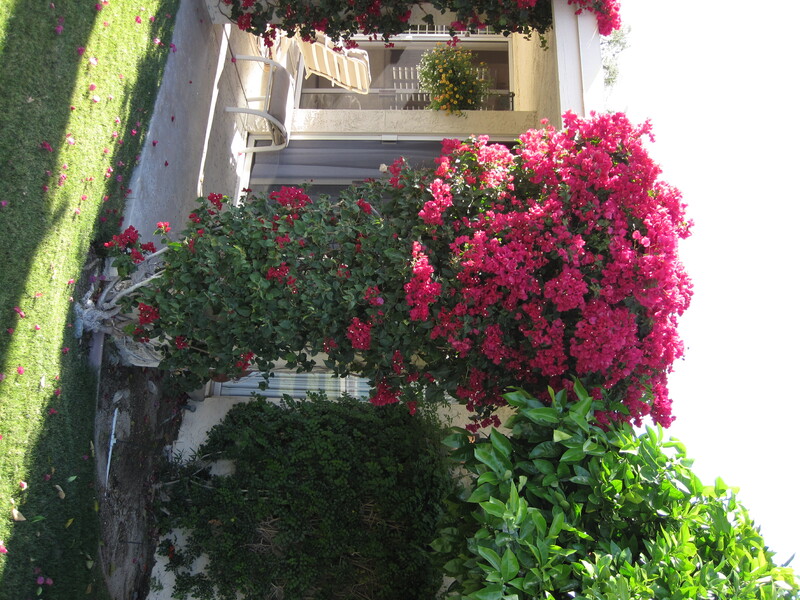 I absolutely love Bougainvillea. I see it all over where we stay in Palm Desert, California, and I have one in a pot that I bring in each winter, as it is not hardy in our Zone 5. A great perennial climber, it loves to be on the south side of a house. There are so many different varieties of clematis, you could always have one in bloom in a different color. I love the fall-blooming white clematis paniculata. It has a great fragrance.